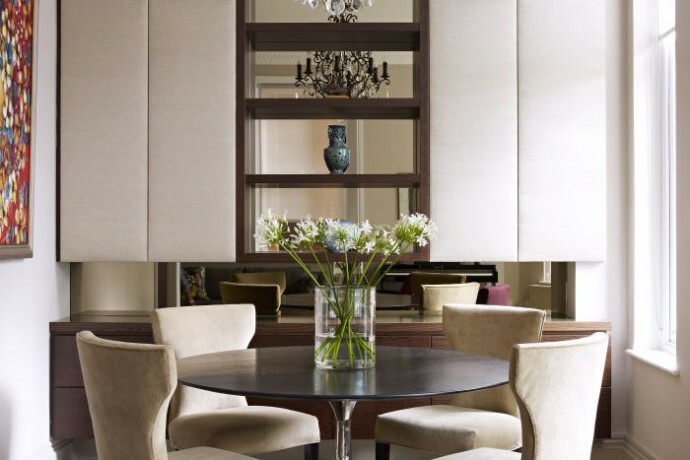 Callender Howorth specialises in interior design, interior architecture and interior renovation in St. John’s Wood. Please have a look at our portfolio of completed projects or contact Mark or any of our St John’s Wood interior designers. We are available to design and work on houses, apartments, penthouses, basements, lofts and commercial spaces. We are happy to come to you to discuss requirements and let you know our interior designer fees for St John’s Wood. St John’s Wood is a highly sought after and exclusive borough of London. The area is distinguished by its ‘villa’ housing and mansions as opposed to the terraced housing that was prevalent in the rest of London up to the nineteenth century. It may lack the glitz and glamour of similarly upmarket areas, but it’s still one of the most prestigious areas of London and St John’s Wood interior designers delight in their work in the calm and leafy neighbourhood. Beatles fans will be pleased to hear that the Abbey Road Studio where the fab four recorded their famous Abbey Road album is in close proximity, as well as the zebra crossing that featured on the album’s cover. Sir Paul McCartney also lives in the area. Is St John’s Wood close to museums and exhibitions? There are plentiful things to see and do in St John’s Wood. Lord’s Cricket Ground is nearby as well as The MCC Library containing the world’s largest and most comprehensive collection of books and publications dedicated to cricket. There is also a fantastic open-air theatre to enjoy. It is a very family-friendly area with both the Sherlock Holmes museum and the world-famous London Zoo in close proximity. St John’s Wood boasts an array of popular pubs. Gastro pubs that cannot be missed include the Duke of York and the Ordnance Arms, which offer a wide array of drinks and fantastic menus. The New Inn is a dog-friendly gastro-pub, refurbished by St John’s Wood interior designers in 2011. St John’s Wood is also the home of Oslo Court restaurant, located within the unlikely location of the Oslo Court block of flats, designed by architect Robert Atkinson in the late 1930’s. And for those looking for the perfect place to enjoy a relaxing breakfast, lunch or coffee, Fego Caffe is a very popular choice and a great place to grab an all-day brunch. The architecture of the area is as diverse as it is beautiful. Callender Howorth is delighted to have recently transformed an apartment within a stunning redbrick Belsize Park mansion. Our St John’s Wood interior designers completely renovated the property from something tired and dilapidated into a luxurious family home. We implemented an eclectic look with artistic Indian influences that reflected our clients’ style and heritage blended into the light and modern interior. Key to the success of the project was pushing the boundaries of the Victorian interior architecture whilst remaining true to its original charm and features. Why would you want to live there? Which famous residents live in St John’s Wood? St John’s Wood is ranked by influential Forbes magazine as the fifth most expensive postcode in London – making it a highly sought after area in which to live in the capital. Not only does the neighbourhood have fantastic links to the heart of the city, but also the M4 is a stone’s throw away making an escape to the country trouble-free. St John’s Wood is also extremely attractive for those with children. There are a number of highly commended schools in the neighbourhood including the Gateway Primary School and the American School in London. Our St John’s Wood interior designers can create kid-friendly interiors that are practical, stylish and fun. A number of well-know faces live in this area including Sir Richard Branson, singer Lily Allen, entrepreneur James Caan and Keith Richards of The Rolling stones. Speak to our St John’s Wood interior designers to get more information about our services.